Scientists researched that eyes developed 500 million years ago with simple functions of only being able to see light and dark. Which is pretty remarkable considering the camera like vision we have today. Your eyes work incredibly hard from the moment you wake up to the moment you sleep, but most of us take this part of our body for granted and expect our sight to be perfect when we offer little protection or thought about our eye health. 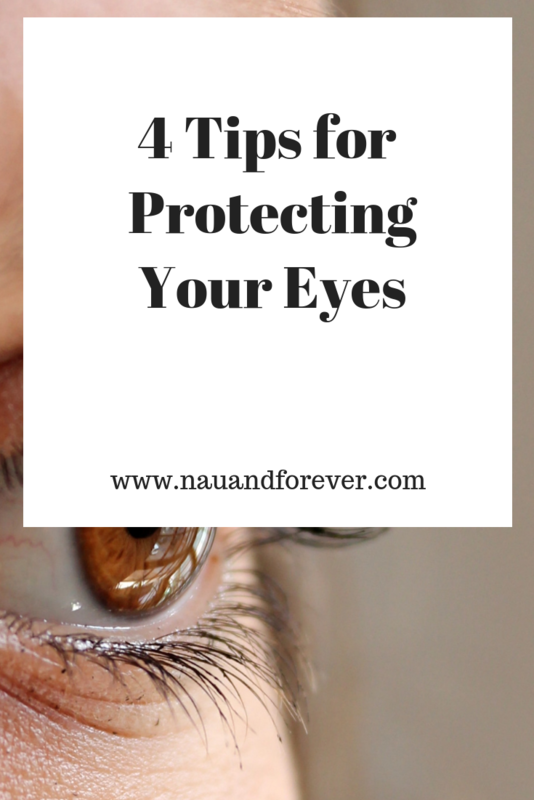 Which is why below are a few simple pointers for protecting your eyes from irreparable damage causing your vision to deteriorate, infections or worse becoming blind. There is evidence to suggest your eyes will deteriorate faster if they’re exposed to UV rays for extended periods of time. For example, elongated exposure can contribute to boosting your chances of cataracts. Most of us love the sun too much to stay out of it completely, so instead try using this tip as an excuse to go out shopping for some new sunglasses. Ideally, search for sunglasses which have a little sticker on the front informing you of the sunglasses protection against UV rays. Choose any which block 99% to 100% of UV rays for optimum protection against the sun’s harmful rays. Most people keep their makeup well past the date it should be used by. Unlike food, it doesn’t come with an expiration date. It’s just expected you will dispose of it eventually, which (if you’re like me) isn’t usually the case. Any makeup product that’s used around the eye area which is at least 3 months old and still sitting in your makeup bag, urgently needs to be chucked out. This is a preventative measure to avoid an eye infection. Which means your mascara, concealer, foundation, eyeliner, and eyeshadow may have to go. This can be incredibly annoying for those who spend a fair amount on their Nars and Mac makeup, but old makeup is literally a breeding ground for bacteria which is why it could be affecting your eye health. Try to keep a mental note of when you last purchased your pieces and simply use them by the expiry date or get rid. This will help to prevent any unnecessary eye problems which could result in itchy, painful, swollen eyes. Find an optometrist to book regular eye examinations assess your vision, talk about any problems you are having with your eyes and allow the eye examiner to bring any issues to your attention. Nothing beats confidence that your eyes are healthy and working properly than validity from a professional. You can expect an exam of your eyes to include reading letters, numbers, and images at a set distance. The doctor will ask you questions about your vision. If your vision needs a little assistance to prevent straining, you could be given glasses or contacts. This step will help alert you of any `serious problems with your eyes that you may be unaware of, which is why it’s important to have regular check-ups. Eating the above foods will also help you to maintain a healthy physique. In doing so, it will reduce your risk of type 2 diabetes which is the leading cause of blindness. Following these tips can help you avoid eye problems. You want to be sure you’re protecting your eyes because they are the only ones you’ll get. Keep your vision healthy and prolong your sight for years to come. Want more tips on staying healthy? Check out these tips here.